Are you pregnant and currently contemplating who to invite into the delivery room? These days, it is not just commonplace for husbands or partners to attend births, but mothers, children, relatives and friends are also frequently encountered during birth. 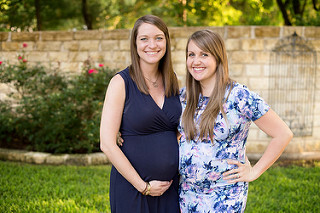 If you plan on inviting friends to your labor and delivery, what should you know? There are a whole host of issues you should think of in advance in relation to your friendships. But before we get to those, we'll just say that most hospitals do place a limit on the number of people who can be right there in the room with you. If you want to invite many people, some of them will probably have to spend some time in the waiting room. If there is an emergency or you require a c-section, your husband can usually be in the OR with you, but no other friends will be allowed. It is a good idea to check your hospital's policies ahead of time. Although lots of friends may seem cosy to you, doctors, midwives and nurses may not agree and your "party birth" may cause some tensions between you and your care providers. Now let's take a look at the kind of friends you'd want at your baby's birth you'll agree that they should be calm, and not the kind of person who freaks out at the sight of blood or a needle. They should also be respectful of you in all situations, and non-pushy. And it is important that the friend of friends you invite to your baby's birth will not be offended in the event that you suddenly feel like you want privacy, and would rather your friend leaves the delivery room. Whatever you decide, the key is to make agreements in advance both with the hospital and your care provider, your partner, and your friends.